AWD. ACT NOW - schedule your automatic savings appointment with our Internet Sales Team. All coupon offers must be presented upon arrival. 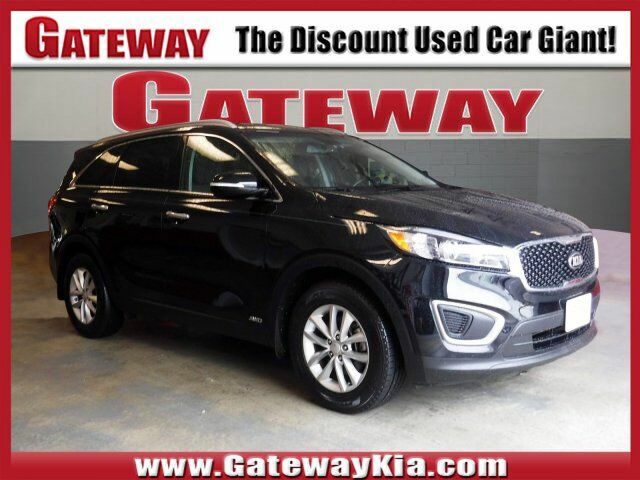 * The 2016 Kia Sorento has been redesigned with a sleeker, more sculpted exterior. It has a wider stance and longer wheelbase for an even more versatile cabin space with available seating for up to seven. The automatic and intuitive available hands-free Smart Power Liftgate opens when it senses your smart key, the liftgate can even be adjusted to your height preference making it easier to close. The Sorento comes with a choice of 3 engines including a 2.4L with 185hp, a 2.0L turbo engine making 240hp, and a 3.3L V6 producing 266hp. With the available Dynamax All-Wheel-Drive system, the Sorento delivers a smooth, refined drive even on rough roads and combined with the V6 engine can tow up to 5,000lbs. The spacious cabin is clean and modern featuring available heated and ventilated seats with nappa leather trim, a 14-way power adjustable driver's seat, a panoramic sunroof, and up to 8 available power outlets. The standard cloth seats are designed by YES Essentials and features soft, quick-drying fabric that resists stains, reduces static, and even helps eliminate odors. With UVO eServices you have in-car connectivity based on the capabilities of your personal device on an 8 inch touch screen. Features can include internet radio, navigation, a rear-camera display, and parking minder which can track where you parked your car with the assistance of your smartphone. The Clar-Fi and 10 speaker Infinity Surround Audio System bring you rich, clear sound as it was meant to be heard. Safety features include available blind-spot detection, back-up warning systems, lane departure warning systems, and advanced smart cruise control. Passive features include the all-new body constructed with 58% advanced high-steel and advanced airbags. Source: The Manufacturer Summary*Price (s) include (s) all costs to be paid by a consumer except for licensing cost, registration fees, taxes, and documentation fee. Because errors may occur, please contact us before purchasing to verify options, incentives, discount offers and availability. Factory rebates subject to change without notice. Not responsible for errors or omissions.